Mangaluru, Jan 16, 2018: Mayor Kavitha Sanil, Council Chief Whip Shashidhar Hegde, Town Planning Standing Committee Chairman Abdul Ravoof and others pay visit to Thumbe dam on Monday. Mangaluru Mayor Kavitha Sanil made an earnest appeal to the people not to waste water. Soon after paying a visit to Thumbe dam on January 15, Monday she told media that water has been stored up to 6 metre height for the first time since the dam was built across the Netravathi river. About 10.83 million cubic metre water is stored in the dam. Last year, water was stored for five metre height. The vented dam had 3.23 metre water during last March, she added. 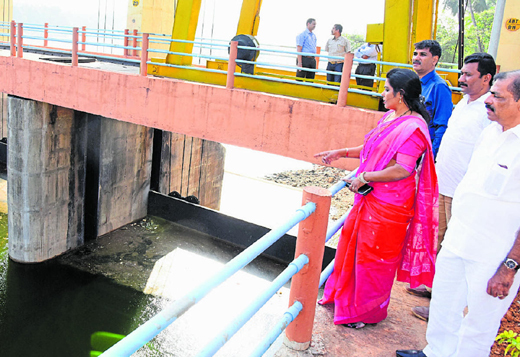 The stored water will last for 55 to 60 days, if utilised judiciously, she stated. The mayor requested the citizens not to waste water. "Do not waste water for washing vehicles and for splattering on roads. But there is no need for water rationing as of now," she added. Sanil said she and the city corporation officials have been visiting the dam on a regular basis to check water level. Mayor Sanil said the compensation for 26 people, whose lands were inundated for the dam, has already been dispensed. This is related to the owners of the 18 acres of land which was immersed during the raising the dam level to five metres. About 50.88 acres of land, belonging to 37 people in the nearby villages, was utilised while increasing the storage level of the new dam to six metre. But there is no loss of agricultural land. They are being paid Rs 39 lakh per year in the form of rent, she said and thanked the people for their cooperation. City corporation council chief Whip Shashidhar Hegde, Town Planning Standing Committee chairman Abdul Ravoof, Commissioner Mohammed Nazir, Executive Engineer Gururaj Maralihalli and assistant executive Engineer Naresh Shenoy were present.